Root canal treatment has an undeserved reputation as exceedingly painful. This does not have to be the case. Dr. Hadgis’ gentle, effective treatments can help you get this very necessary procedure, pain-free. Root canal treatment is also called endodontic treatment, and many dentists now use this term to avoid the negative image associated with the term “root canal” when offering this vital treatment to their patients. 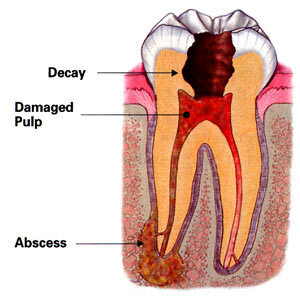 Root canal treatment becomes necessary when you have an infection inside a tooth. As with all other parts of your body when you have an infection, your body sends antibodies and white blood cells to the area, which causes the affected tissue to swell. Inside your tooth, there is no extra room—when the tissue swells, it “chokes” itself and dies. This becomes a constant source of infection called an abscess. Dr. Hadgis removes the dead and diseased tissue, cleaning out the inside of the tooth thoroughly, then fills the tooth with a sealant. Because so many people dread root canal treatment, they may ask their dentist to extract the tooth rather than undergo endodontic treatment. In general, a tooth extraction is far more traumatic than a root canal. Whenever possible, we encourage you to preserve as much of the natural structures of your teeth as you can. Depending on the size of the cavity and strength of the remaining tooth structure, Dr. Hadgis will restore the tooth with a white composite filling, or if too much of the tooth is gone, with a dental crown. Over time, a tooth that has had a root canal treatment may become discolored, so a dental crown might be the best solution if the tooth is towards the front of your mouth. Don’t suffer needlessly. If you have a toothache, contact our office today to see if we can help. The treatment is usually not difficult for the patient. If you are an anxious dental patient, see our page on sedation dentistry. Pain after a root canal treatment is rarely a large issue, and is most often treated successfully with over-the-counter pain medication containing Ibuprofen.